Kyan O'Regan and his mother Jaime O'Regan at the opening of the John Villiers Centre of Excellence for the early intervention of Autism. AUTISM can be tough for anyone to deal with but a new centre in Mackay is helping make things a little easier. The Mackay Whitsunday autism early intervention centre, officially known as The John Villiers Centre of Excellence Mackay-Whitsunday, was opened today by member for Mackay Tim Mulherin. It will help provide services for autistic children as well as support for their carers. Chief executive officer Penny Beeston said the centre played a vital support role for families and professionals in the region. "We've waited a long time for this centre," she said. "It was made possible through the support of the Queensland Department of Communities, Child Safety and Disability Services, The John Villiers Trust, Aurizon, Education Queensland and local businesses and individuals who recognized the need." Ms Beeston said the centre was a wonderful resource for the region. 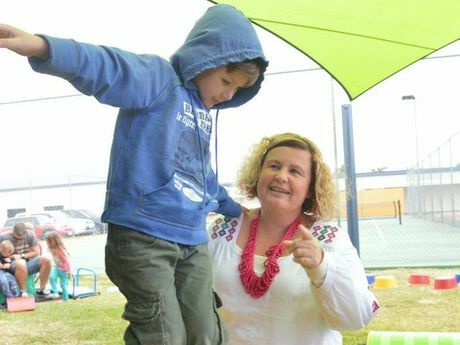 "The Mackay Autism Support Group use the centre for their meetings and resource library, and we also welcome childcare staff, teachers and other professionals wanting to benefit from Autism Queensland's expertise at the centre," she said. The programs on offer are intensive and specialised, helping children and their carers. It will be a permanent home base for Autism Queensland. Parents interested in accessing the service should phone Ann-Marie Watson at Autism Queensland on 4841 8300 or email mackay@autismqld.com.au. see also http://a4.org.au/a4/node/817 for Bundaberg's centre.